Inside Out is a 2015 computer-animated feature film from Pixar Animation Studios. The film is directed by Pete Docter and is based on a story written by Docter and Ronnie Del Carmen (who also co-directed this film). Inside Out focuses on a 'tween girl who struggles with the move to a new home and on her animated emotions who get carried away by her stress. 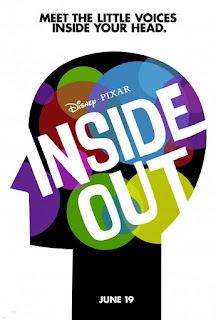 Inside Out was executive produced by John Lasseter and Andrew Stanton. Riley Anderson (Kaitlyn Dais) has within her mind, five personifications of her basic emotions: Joy (Amy Poehler), Fear (Bill Hader), Anger (Lewis Black), Disgust (Mindy Kaling), and Sadness (Phyllis Smith). This quintet influences Riley's actions by using a console in her mind's Headquarters. The emotions' biggest challenge comes when Riley is 11-years-old. Riley and her parents, Bill Andersen (Kyle MacLachlan) and Jill O'Riley-Andersen (Diane Lane), move from her birthplace in Minnesota to San Francisco for Bill's new business. Joy, who is the leader of the emotions, is determined to keep Riley happy during this transition. However, an accident sends Joy and Sadness far away from Headquarters, leaving Anger, Disgust, and Fear in charge. Chaos ensues, and Joy is determined to get back in order to take charge and fix the problems. But can she get back in time before a great disaster occurs, and does she know what the problem with Riley really is? Sometimes, it seems pointless to review Pixar movies, especially when they are as exceptionally good as Inside Out most certainly is. Of course, this film is gorgeously animated. Of course, it is both inventive in its conception and powerfully moving in its drama. Inside Out is the best non-sequel Pixar film since 2009's Up. So instead of heaping more praise on a movie upon which much praise (and an Oscar) has already been heaped, I will talk about a few things I liked about Inside Out. I liked how the film emphasized that it is okay for people not to be happy all the time, that it is okay to sometimes be sad. Joy and sadness go hand in hand, and sometimes they are connected in ways we never realize. Obviously, Inside Out seems to be a movie made by filmmakers who are parents and who wish that their children would never grow up, but realize that of course they will. Inside Out is about change, and sometimes change is painful for the things that we lose that we cannot get back. Sometimes, we should not even want to get back things that are recoverable. The voice performances are, all around, quite good. I particularly liked Richard Kind as Riley's former imaginary friend, Bing Bong. Amy Poehler's turn as Joy is full of shifts in character, mood, timbre, and color that not only define Joy, but also shape and define the narrative. Lewis Black is surprisingly nimble as Anger, and Bill Hader manages to make his character, Fear, stand out when he could easily disappear into the pack. I have to admit that I find Kaitlyn Dias exceptionally good as Riley; her performance makes the character seem genuine and goes a long way in making Inside Out work. I won't say that this film is perfect. I think the first 25 minutes are problematic because the story struggles. It is as if the storytellers cannot hide the fact that they are bored with the obligatory set-ups and cannot wait to get to the part where the story really begins. I have often heard it said or read that Pixar is like classic Walt Disney animated film in that Pixar movies have heart. I think that Pixar's storytellers are willing to grapple with the bittersweet nature of life. Like true artists, they find beauty in life: the good, the bad, and even the mundane. Pixar sells hope and embraces the fight for survival... or at least for something better. Some might think of this as American middle class values. I think Pixar's films are timeless and universal. Woody and Buzz Lightyear's race to catch up to the car at the end of Toy Story will always be compelling. And now, Inside Out has Joy and Riley's journey, and I don't think that story will ever grow old.